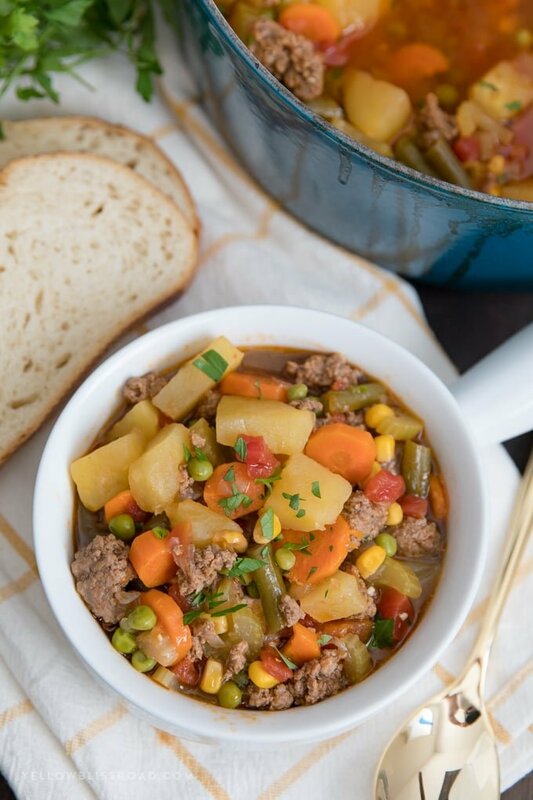 With tons of vegetables and a savory, smoky tomato-y beef broth, this Vegetable Beef Soup is a knock your socks off amazingly simple dinner, and perfect for the cold winter months ahead. We are huge soup fanatics in our home. My kids practically jump up and down with glee when they hear that mom is cooking soup for dinner. And of course they always want to help. 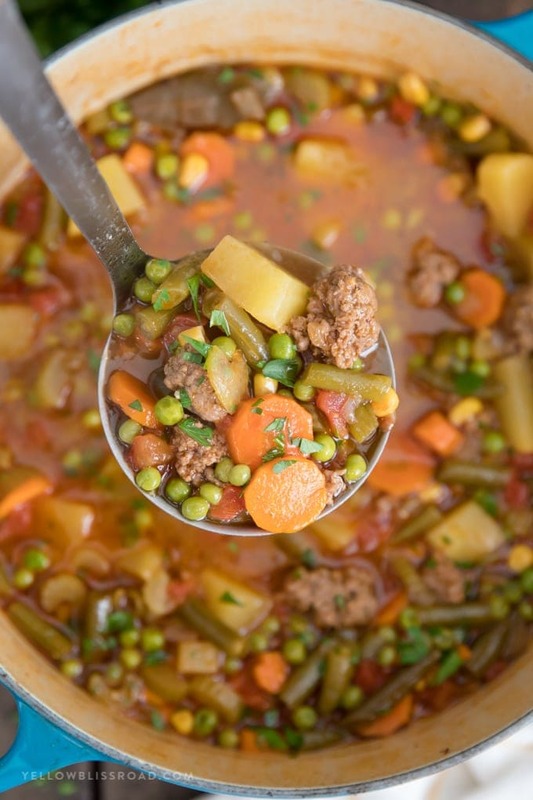 Something as simple as this Vegetable Beef Soup is a perfect way to not only get dinner on the table quickly and in one pot, but to get kids helping in the kitchen as well. Serve it up with some crusty french bread and you’ve got a hearty winter meal out of ingredients you probably already have on hand. Cut vegetables into equal sized pieces. We like to keep the pieces fairly small so you can fit a lot on your spoon. So many different types of vegetables will work for this recipe, but our favorites are the ones you see pictured – peas, carrots, potatoes, celery, green beans, corn, onions and tomatoes. You can use fresh if you have them, canned or frozen. I recommend peeling the potatoes and the carrots, but it’s not required. Cook the beef with some onion and garlic. Make sure to season with salt and pepper. This will be a main part of your soup, so doing this step adds flavor to the meat itself. I use ground beef to keep things super easy and so I can get dinner done in a flash. You can use other cuts of beef as well if you like (we’ll talk about that more later). Transfer the meat to a plate so you can start cooking the vegetables. Ground beef tends to release a lot of juices and grease, and you’ll want to clean that out of the pan before adding the veggies. Toast the spices and seasonings. I do this every time I make soup! First add the celery to the pot so it can begin to soften. Stir in bay leaves, thyme, salt and pepper and cook for a minute or two. Toasting the spices helps to release their aroma and flavor and will add another level of flavor to your soup. Then you can stir everything (veggies, beef, broth) together to make your soup. Liquid Smoke. 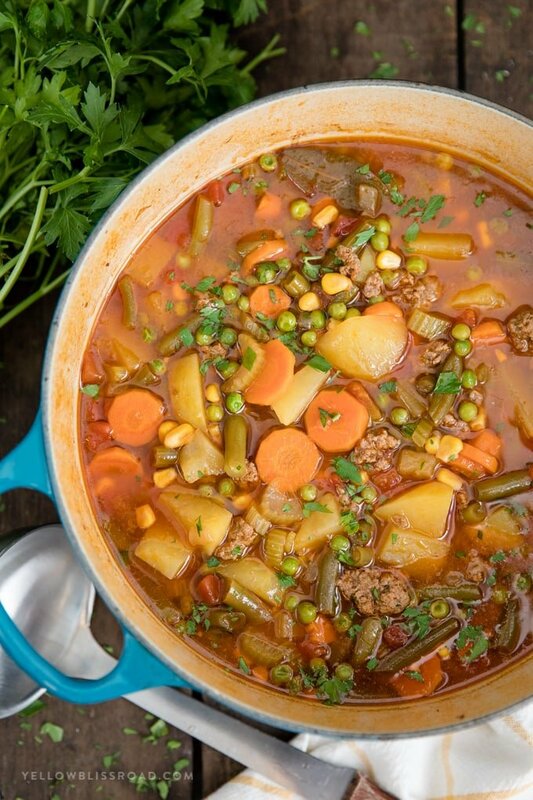 This is definitely the key to the flavor of this Smoke Vegetable Beef Soup! Liquid Smoke (aff) is literally the liquid made from hickory, applewood or mesquite wood that is burned inside a chamber. As the smoke rises it is captured in a condenser and it cools. The cooled smoke forms water droplets (condensation). These droplets are then collected and filtered twice. (source). All you need is a teaspoon for this soup to give it that rich smoky flavor. I also use Liquid Smoke to give my Slow Cooker Kalua Pork that “smoked-in-the-ground” flavor. If you’re not a fan however, you can certainly leave it out. 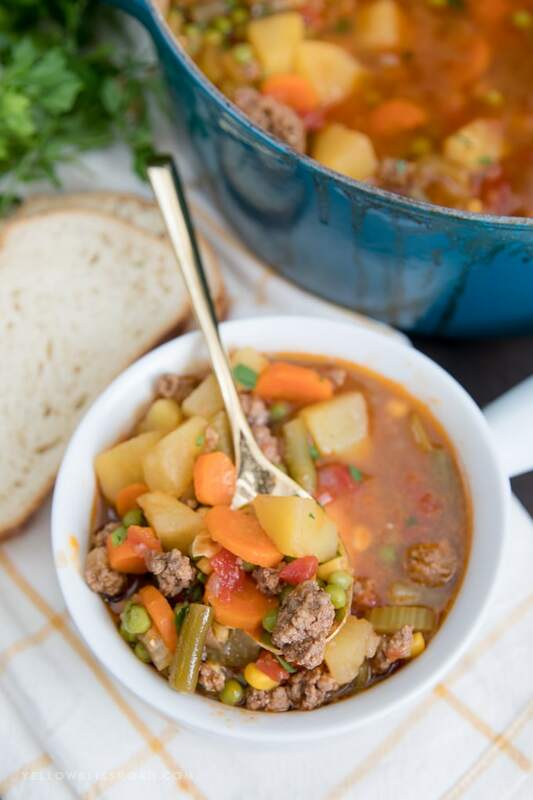 There are a couple of different types of beef that will work well for this soup recipe. Ground beef is going to be the quickest way to get a tender texture while at the same time imparting a good amount of flavor. However, chuck roasts are one of the favorite cuts of meat for soup because it is tender and flavorful. It just takes a lot longer to prep cook. To make Vegetable Beef Soup with a chuck roast, you would need to first cut the roast into 2-inch chunks, then brown the chunks of beef in olive oil (just for a few minuses, not cooked through). You’ll need to add about 30-60 minutes to your stove-top cooking time to get them fully cooked through and tender. What are the best spices for Vegetable Beef Soup? My favorite soup spices are thyme and bay leaf. But you could also add some oregano or even Italian seasoning. Paprika would be a delicious addition as well. As I mentioned earlier, you’ll get a lot more bang for your buck by toasting the spices first. Want some more delicious soup recipes? 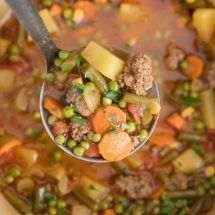 Smoky Vegetable Beef Soup is a simple dinner made in one pot, with a tomato beef broth, ground beef and tons of vegetables. Cut vegetables into equal, bite-sized pieces, peeling if desired. Set aside. To a large soup pot over medium heat, add ground beef, diced onion and minced garlic. Cook until beef is cooked through and no longer pink. Transfer meat to a plate and wipe any excess grease from the pot, leaving about a tablespoon or so behind. Add celery to the pot and cook for about 5 minutes to soften. Stir in bay leaves, thyme, salt and pepper and cook for a minute. Stir in potatoes, tomatoes, corn, green beans, carrots and ground beef, then pour in beef broth and liquid smoke. Bring to a boil, then reduce heat to low, cover and simmer for 20-30 minutes. Add peas and cook for an additional 15-20 minutes. Stir in fresh minced parsley and serve hot. *If you would prefer to use chunks of beef, cut a 2 pound chuck roast into bite sized pieces and brown in olive oil with the onion and garlic. Then continue with step 2. Your recioe looks great. What adjustments would I have to make if I used stew meat instead of hamburger? I dont’t want to overcook the vegetables. I would brown the meat (doesn’t have to be cooked through, but should be browned on all sides), then boil with the beef broth for an hour. Add the veggies at this point.